As I get bored with my studies, so I spared some time surfing the net, doing some personal research regarding Rubik's Cube, for fun. I bet everybody knows what is Rubik's Cube, and guess what I found, yea, as what I stated at the title above. Based on what I found in the net, Google for sure, Rubik's 360 is being released this year, 2009! Oh well, the inventor is Prof Ernő Rubik, as he is the inventor to invent mechanical puzzles such as Rubik's Cube. Basically there are 3 spheres in 1 set of Rubik's 360. The biggest in size will be outside with few empty slots, then a middle in size of sphere located inside of the biggest sphere, and the smallest sphere will be located in the inner most. The inner most sphere contains 6 coloured balls. 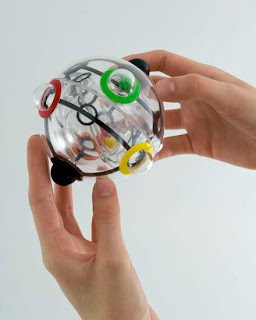 All we have to do is just to get the 6 coloured balls from the inner most sphere into the matching slots on the outer most sphere by shaking them through the middle sphere that has only two holes. Sounds fun? This is how Rubik's 360 looks like. Note that, it has only ONE solution for the time being. Try to do some research about it.